A fantastic article (below) written by Amy Dockser Marcus on February 14, 2010 for the Wall Street Journal on how the carriers of genes for diseases, including rare ones such as Gaucher's Disease, can be severely affected. When people learn they are carriers for a genetic disease, doctors usually focus on the potential risk of having a child with the disorder. But, increasingly, researchers are finding that being a carrier itself can lead to serious health problems. Carriers of Gaucher disease, for example, don't have the enzyme-deficiency disorder that can cause lung disease, anemia and arthritis. They do, though, have a risk of developing Parkinson's disease that is more than five times greater than the general public, according to a recent study in the New England Journal of Medicine. Carriers for cystic fibrosis are at increased risk of getting chronic sinus disease or a severe form of asthma. And carriers for fragile X syndrome, the most common cause of inherited autism and other mental impairment, are at higher risk for a variety of illnesses, including premature ovarian failure in women, depression and anxiety, and late onset neurological problems. Photo by Sandy Huffaker for The Wall Street Journal. Grace Klein (left), 13, has Gaucher disease. Her parents, Kenneth Klein and Lisa Black, are carriers and may face their own health risks. Until now, the assumption was that carriers needed to only be concerned about reproductive issues and the risks of children inheriting a disease that doesn't manifest itself in their parents. In fact, people often first learn they are carriers if they do a genetic blood test when trying to get pregnant. Although genetic diseases are rare, "we've got millions of people out there who are carriers," says R. Rodney Howell, chairman of the federal Advisory Committee on Heritable Disorders in Newborns and Children. Now, a growing body of scientific research is focusing on carriers and the possible health complications they may face. Carriers for some inherited diseases can take precautions. There is some medical evidence, for example, that carriers for sickle-cell disease, an inherited blood disorder, can have more problems associated with heavy exercise than non-carriers, although medical experts say the number of carriers affected is small. The National Collegiate Athletic Association's Sports Medicine Handbook recommends that athletes who are sickle-cell carriers be given adequate rest time between repetition of drills and be excused from performance tests such as serial sprints or timed mile runs. In June, the NCAA also asked member colleges and universities to test all student athletes to determine if they are carriers for the disease. The move was part of a settlement of a lawsuit filed by the family of Dale Lloyd II, a football player and student at Rice University who collapsed on the field during a 2006 practice and died the next day. A medical examiner determined that Mr. Lloyd died of acute rhabdomyolysis, which causes a rapid breakdown of muscle tissue. "Testing indicated [Mr. Lloyd's] status as a carrier of the sickle-cell trait contributed to his death," the NCAA said in a press release. The studies done so far have looked at relatively small groups of patients in specific diseases and can't yet be applied broadly. "No one doubts that being a carrier comes with a reproductive risk, but we aren't certain what it means for our own personal health. We need to review the evidence disease by disease," says Michael S. Watson, executive director of the American College of Medical Genetics, a professional organization. In most cases, finding out you are a carrier "doesn't change anything," he says. Kenneth Klein and Lisa Black learned that they were carriers for Gaucher disease 13 years ago, after their daughter was born with the disorder. They didn't have concerns about their own health until Mr. Klein heard about the New England Journal of Medicine study linking being a carrier for Gaucher to Parkinson's disease. Eager to learn of any preventive steps he could take against Parkinson's, Mr. Klein contacted the study authors—but he was told that currently there was no way to act on the information. Photo by Ariel Zambelich for the Wall Street Journal. Carrie Rose (right) says she has health problems related to her status as a carrier for fragile X syndrome. Her son, Nick (left), and uncle, Lloyd Darwin, have the disorder. Mr. Klein, a 50-year-old law professor in San Diego, was worried, especially because his wife's father had died from complications related to Parkinson's. The study, which involved about 5,700 Parkinson's patients and some 4,900 control subjects, also found that Parkinson's patients who are Gaucher disease carriers developed symptoms of Parkinson's much earlier than non-carriers. Being a carrier for Gaucher is the most significant risk factor found so far for Parkinson's disease, says the study's principal investigator, Ellen Sidransky, chief of the Section on Molecular Neurogenetics at the National Human Genome Research Institute. In the case of fragile X syndrome, the condition is normally passed to a child through the mother. But carrier status can be passed through either parent. A father who is a carrier will always pass the carrier status to a daughter. Estimates of the number of carriers in the general population range from about one in 130 to 260 females, and about one in 250 to 810 males. Randi Hagerman, medical director of the M.I.N.D. 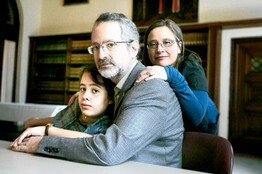 Institute at the University of California, Davis, sees a lot of children with fragile X syndrome in her clinic. She noticed that a number of the mothers were talking about how their fathers were having aging problems, including tremors, cognitive decline, and falling episodes. At a 2000 conference sponsored by the National Fragile X Foundation, an educational and advocacy group, Dr. Hagerman gave a presentation on five cases of older men she had studied and raised the issue that their neurodegenerative problems were connected to their carrier status. "I thought it was rare," Dr. Hagerman says. But at the end of her talk, when she asked how many families had grandfathers who were carriers and exhibited similar symptoms, "a third of the room raised their hands." Dr. Hagerman and colleagues named the problem fragile X associated tremor, ataxia syndrome, or FXTAS, in a 2003 paper published in the American Journal of Human Genetics. Studies by Dr. Hagerman and her colleagues as well as other research groups have linked being a carrier for fragile X syndrome to heightened risk for some other health problems, including hypertension, fibromyalgia and thyroid disease. Carrie Rose, 52, of Mountain View, Calif., says that after her son was diagnosed in 1999 at age 13 with fragile X syndrome at Dr. Hagerman's clinic, she had everyone in the family tested. Ms. Rose and her father turned out both to be carriers. Ms. Rose says she has suffered from depression and anxiety and developed hypertension in the last five years, all issues shown possibly to be linked to carrier status. In 2000, Ms. Rose's father, who had been suffering from tremors and difficulties walking, was the first person Dr. Hagerman diagnosed as having the condition eventually named FXTAS. He died from the disease in 2005. Ms. Rose says her daughter, 27, also has fragile X syndrome and has suffered anxiety and depression. Ms. Rose says her own carrier status has helped explain "a lifetime of why I feel so much anxiety. I am easier on myself now because I know there is a reason for it." But she also thinks about her father's long, progressive deterioration that was connected to his status as a carrier. "There is a part of me that asks, 'Could that happen to me?' " she says. Fascinating stuff; thanks for sharing. This is great information. I have a few friends who's sons have Fragile X and I forwarded it to them.